[slideshow] Hi all! Been very,very busy with all sorts and just haven’t had the time to post earlier. Here’s the most interesting part of the movie poster collection. 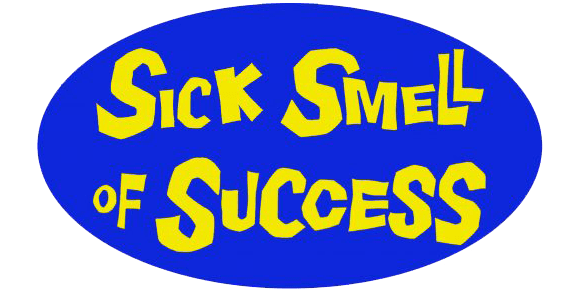 I will regularly update until all pics are unloaded – even the posters I would consider less interesting- and I have gathered all relevant information. 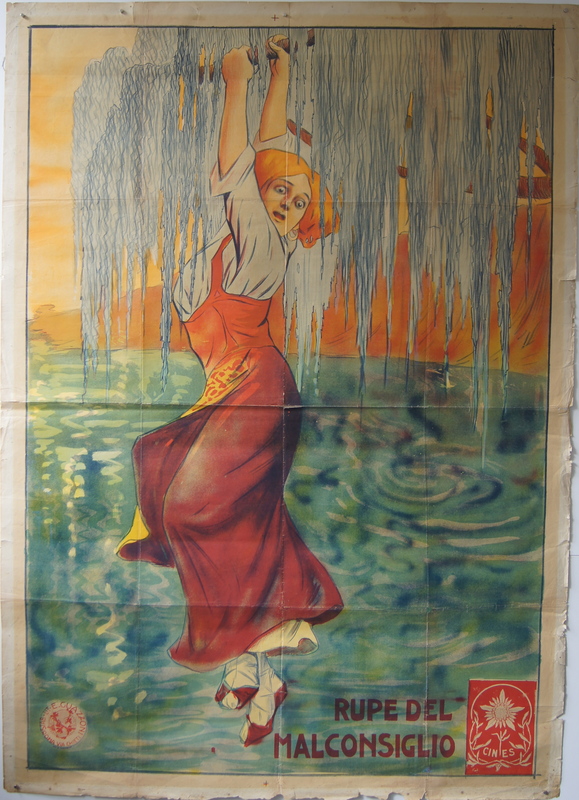 There are quite a few posters I haven’t identified fully if at all and I would like to invite anybody who can shed more light on movie, history or design. To keep the entry managable I use for the most part thumbnails for pics. Just click them and they will open. I really should kick off with the more mysterious stuff, the early silents. Hmm pressed the publish button by mistake, there will be a lot of updates then. To start off then with three posters I have no knowledge of whatever, except that they are early Italian posters. There is no title information, the first and third poster might be trimmed, the second could be a stock poster. 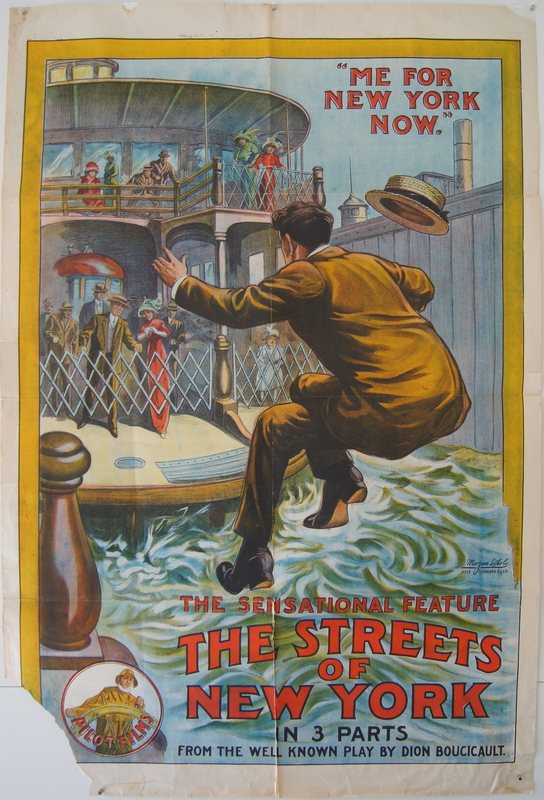 Researching these posters I’m reminded again how many movies were made in the early 1910’s. It’s easy to forget how the technical invention of the movie camera in the late 19th century caused such an explosive cultural revolution. 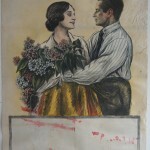 Prime example is this unknown Italian poster. I don’t know the title yet, but it’s a production of the Turin-based company SOCIETA ANONIMA AMBROSIO. Founded in 1906, it closed down in 1924. Nevertheless it managed to produce well over a 1200 titles. The other posters luckily have more information. 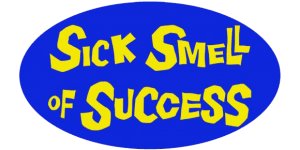 Two of the Italians are from the production company, SOCIETA ITALIANA CINES that still exists (click here). Cines has produced and distributed up to 2000 movie since 1906. The poster on the left is for THE CLIFF OF MALCONSIGLIO aka LA RUPE DEL MALCONSIGLIO, the one on the right is for a comedy BIGLIETTO DI KRI-KRI. 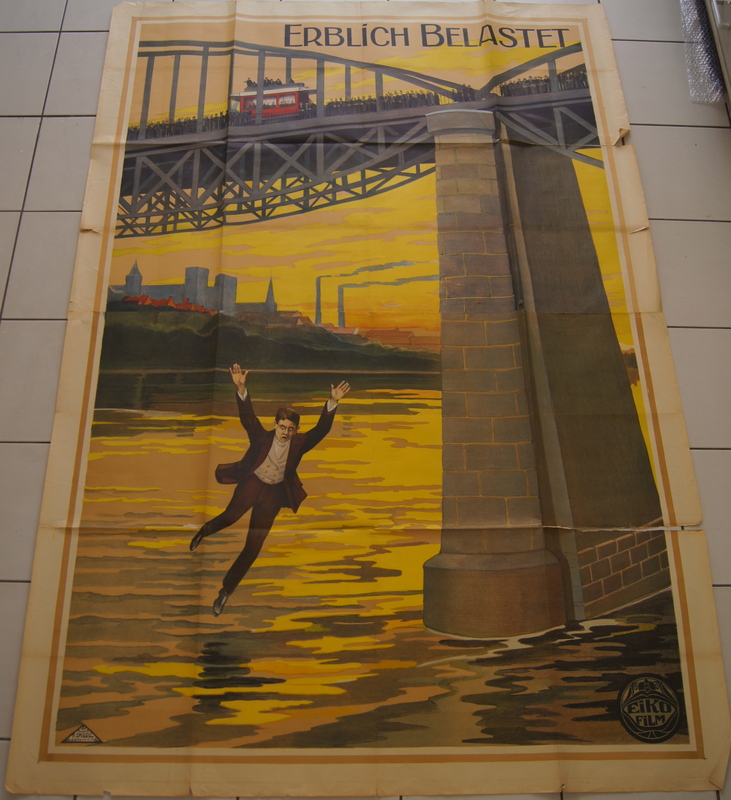 Unfortunately this poster has pieces torn off as it looks rather surreally modern. Kri-Kri was the nom de plume of comedic actor RAYMOND FRAU aka DANDY. You can see him in action here in another Kri-Kri flic from 1915. 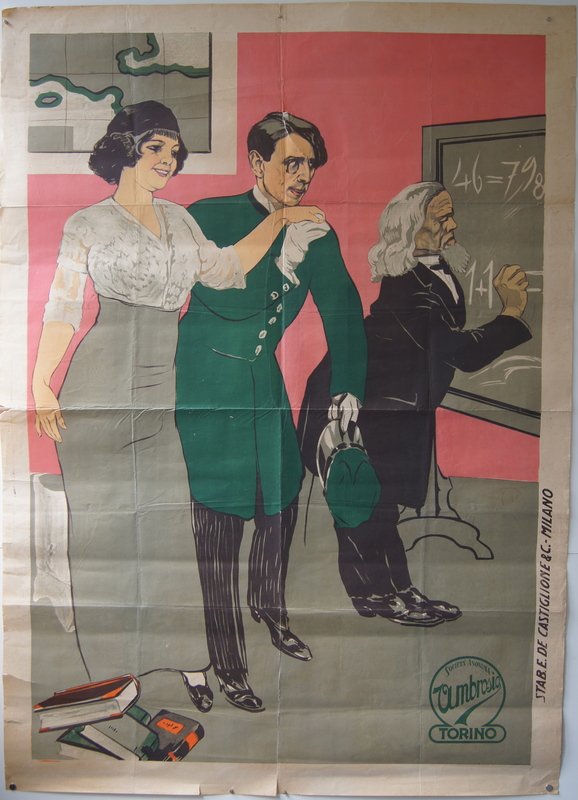 Frau turned out almost 140 of these between 1912 and 1915 as Imdb will attest. CLIFF OF MONSIGLIO is obviously a drama of the heroine to be saved kind. I like the different styles of these posters. 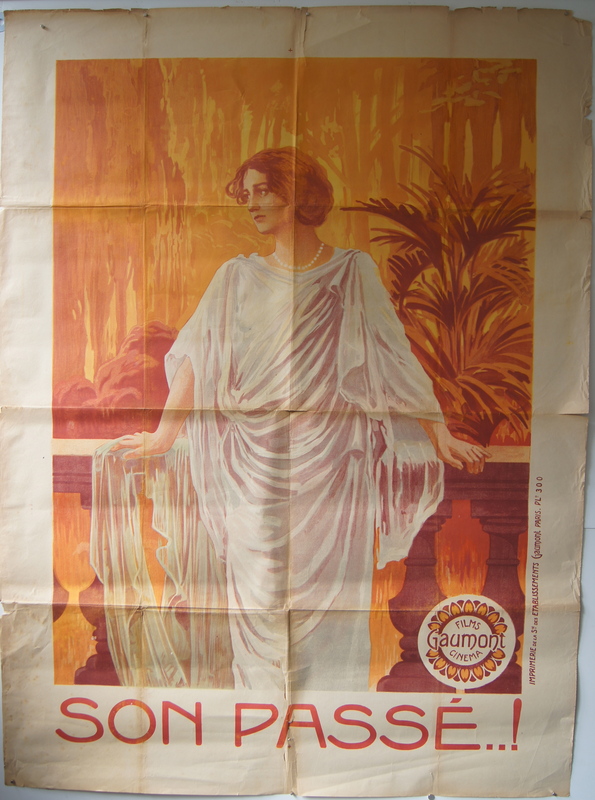 A similar style difference is noticeable between two French posters from the same era. 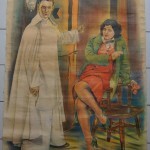 The poster on the left is from SON PASSE, the one on the right is RIGADIN ET LA PETITE MOULINET. RIGADIN ET LA PETITE MOULINET, was a vehicle for CHARLES PRINCE. 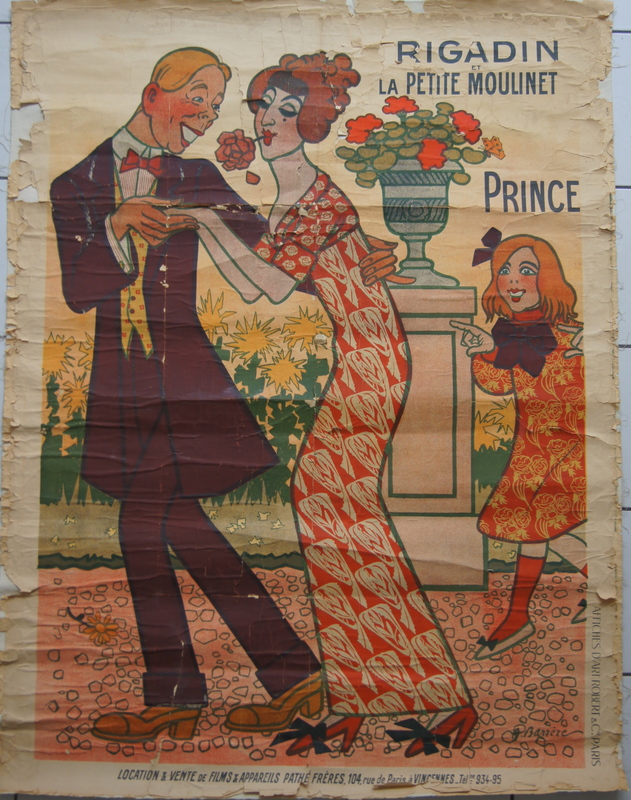 Prince, contemporary of RAYMOND FRAU, was a French giant of slapstick comedy who rivalled MAX LINDER in his day. RIGADIN was his comedy character. 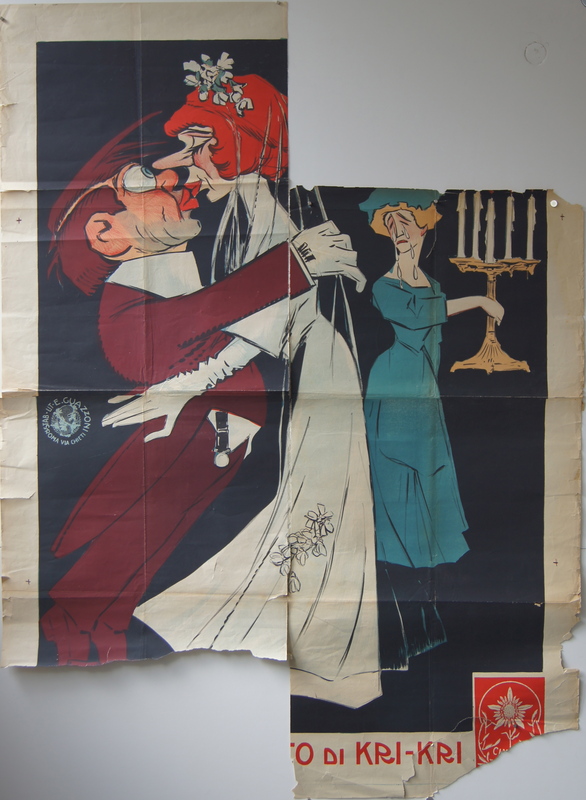 The poster has the distinctive caricatural design from Andre Barrère. SON PASSE on the other hand sports a more dramatic and naturalistic style featuring actress YVETTE ANDREYOR. 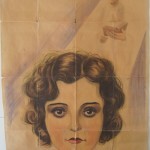 Andreyor was an important French silent actress, not in the least for her performances in several FANTOMAS movies directed by Louis Feuillade. The three German movie posters have another flavour than the French and Italian ones. These three have in common that they’re quite stylized, a bit geometric. Printed in Berlin these posters are big colourful lithos in two parts for crime chaser shorts. 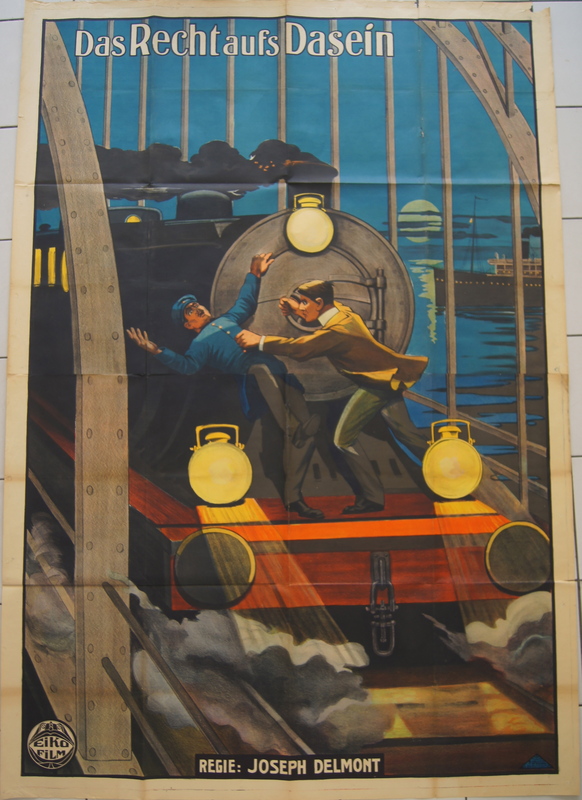 All posters have in common that the action is set against an urban, industrialized setting with plenty of steel bridges. In terms of movie history ERBLICH BELASTET is the more important being directed by HARRY PIEL and starring Ludwig Trautman. The movie was made for Eiko Films. Eiko also made RECHT AUF DASEIN directed by and starring Joseph Delmont. 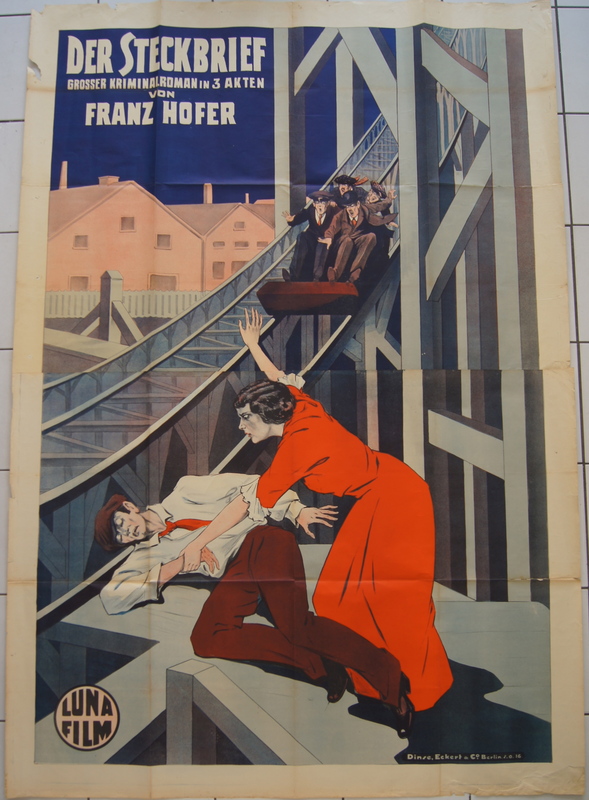 The last poster is from DER STECKBRIEF directed by Franz Hofer. 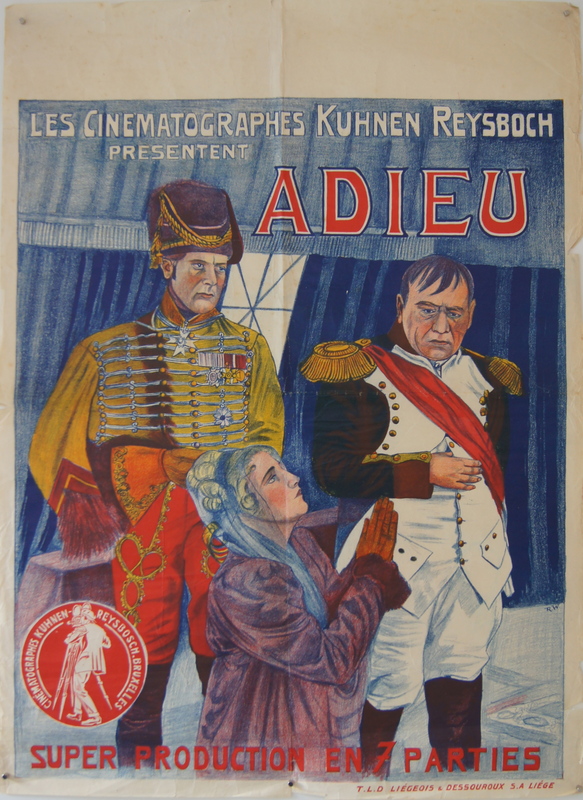 Other silent movie posters in the collection come from Belgium, the UK and US. I can’t find anything about this Belgian movie ADIEU. Les Cinematographes Kuhnen Reysbosch from Brussels don’t show up on Google or Imdb. You think an epic about Napoleon would appear on the internet, but nothing so far. 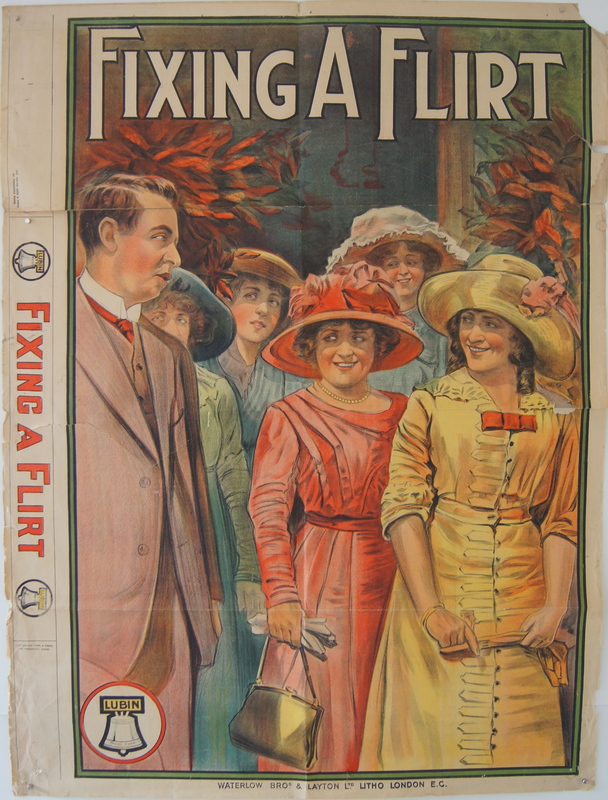 From 1912 is this English poster for the short FIXING A FLIRT. It measures 30×38 inches. 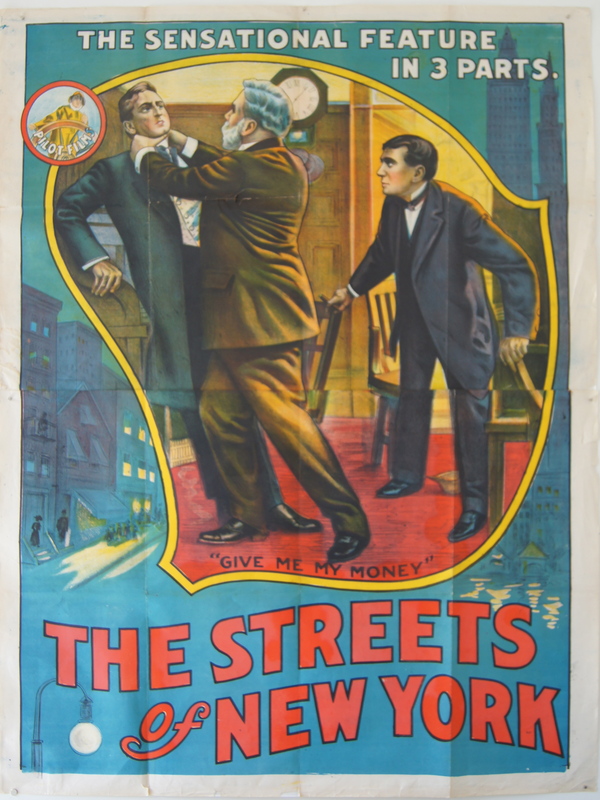 The US posters are from the serial STREETS OF NEW YORK. Unfortunately of one of the chapters I only found the bottom panel.